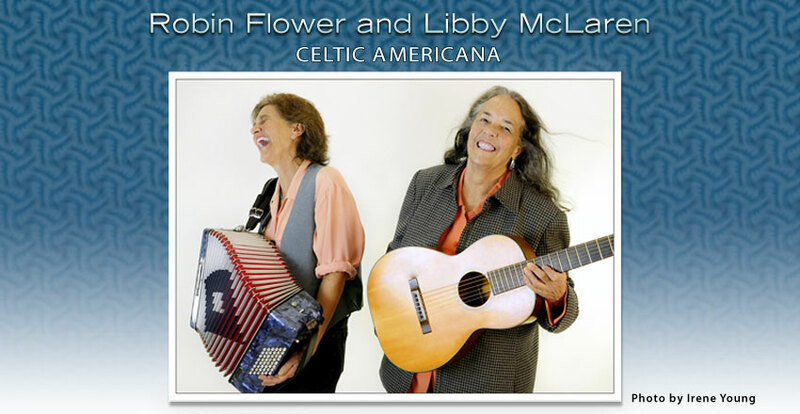 Robin Flower and Libby McLaren have just released their next CD! They have produced a shining gem celebrating their 28 year musical collaboration by recording a new duo CD, One Plus One. On this CD, Robin and Libby play all of the instruments themselves; mandolin, piano, accordion, guitar, fiddle, strumstick and whistling. They sing all of the vocal parts and they wrote most of the songs/tunes. Robin and Libby present One Plus One, a recording featuring just the two of them. Robin Flower came to music because it was part of her family life. Growing up in a working class family in Ohio, Robin sang with her sister Scottie, and played guitar while her parents played harmonicas. Her mother sang songs from her home state of Kentucky. Robin played uninspired elementary school violin while daydreaming about becoming the center fielder for the Cleveland Indians. However, when she started playing guitar, everything changed. The guitar took her breath away. She now understood what she wanted to do with her life. She played for hours, writing her 1st songs and recording them with her sister, culminating in a performance at the Eastern Kentucky Folk and Jazz Festival. Robin continued playing and performing through high school. She worked a few years for the public library, went to art school for a while, delivered mail for the post office and then saw the movie, Easy Rider. She bought a motorcycle, quit her job, and drove the length of the country, spending time in southern California, New Mexico, and Oregon. She played in an oldtime trio, a jazz band, and was lucky enough to be invited to play back-up on a tour with Hazel Dickens and Alice Gerrard, and Elizabeth Cotten. Robin eventually moved to the Bay Area in Northern California to play and tour with a rock band, perform in a trio with Laurie Lewis and Nancy Vogl, play in Holly Near’s band, and record her 1st album, More Than Friends. Two other albums ensued; Green Sneakers and 1st Dibs, both garnering wonderful reviews and awards. Robin spent years with her band touring the US and Canada, performing at major folk festivals and venues. It was during this time that Robin was voted Best New Talent from the readers of Frets Magazine and was given a California Arts Council touring grant. In 1987 she hired Libby McLaren to help produce the vocals on her next album, Babies with Glasses. Libby McLaren was born into a musical family, with a banjo playing Dad, a Mom who always sang and siblings who lead the way with piano lessons, songwriting and performing. Following 12 years of piano lessons and all the choral singing high school and college could offer, Libby became a founding member of a local Berkeley, Ca band called “NightFlyte” and with that band moved to New York City in 1977. Besides gigging and recording with NightFlyte in NYC, she also played solo piano every Thursday night at the renowned Empire Diner on 9th Avenue in NYC, in addition to singing with The Joy Askew Band, and recording with The Longhouse for Warner Bros. In 1983 she teamed up with long-time friend Cha Cha DaVinci to write and record the #1 disco hit of the summer of 1983, “For The Same Man”, a dance song that continues to be popular throughout Europe. In 1984 she began 5 years of playing piano and singing harmonies on tour with the amazing sister singing group, The Roches. While on tour with The Roches, Libby often found herself back on the west coast, and in 1987 she met and began playing music and writing songs with Robin Flower. In between “Flower and McLaren” tours and local concerts, Libby also accompanied on piano and sang with Ronnie Gilbert, touring across America and Canada, in addition to singing on several recordings by Holly Near, Margie Adam, Gary Lapow, among others. 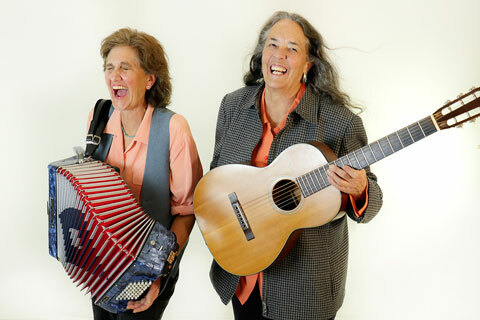 Together, Robin Flower and Libby McLaren’s musical partnership began in 1987, finding their common ground in American and Celtic music. “Playing rock solid traditional music and making it sound brand new while stretching in delightfully in unexpected directions” says Radio Indy. “Roaring from delicate to powerhouse, their music is moving, fun, and dazzlingly imaginative...a musical intimacy that is extraordinary.” Indie- Music.com. “Brilliant!” Sing Out! Robin and Libby have recorded: Angel of Change (with Nancy Vogl), 30 Second Kiss, Steelhead in the Riffles, Twenty Years · Twenty Rivers, A Kiss From The Angel of Change, Camogie (with Danny Carnahan and Mary McLaughlin), and now, One Plus One. They have toured the US and New Zealand, performing at universities and folk venues and playing for contradances. Both women teach privately as well as lead community music groups. Robin has a year-round organic garden and Libby is learning to speak French. They both are avid fly fishers.